Our resemblance to the Clark W. Griswold family from National Lampoon’s Vacation is a little spooky. On the back of this slick, Mom wrote, “Big Spring, Texas,” which clarifies the route we took on the way to California. As the time to pile into our new used lumbering land yacht, a 1973 Cadillac Sedan DeVille, approached, I was getting very interested in aviation. I recall that I repeatedly asked Dad if we could buy an airplane. When that didn’t succeed, it dawned on me that the new car handled a lot like a very large airliner or a cargo plane, and decided that it would be wicked cool if I had a control yoke like one in a jet. To that end, I mentally sketched out a plan to build one out of plywood that I could keep in the back seat of the car so I could “fly” the car from Lawton, Oklahoma, to Thousand Oaks, California. 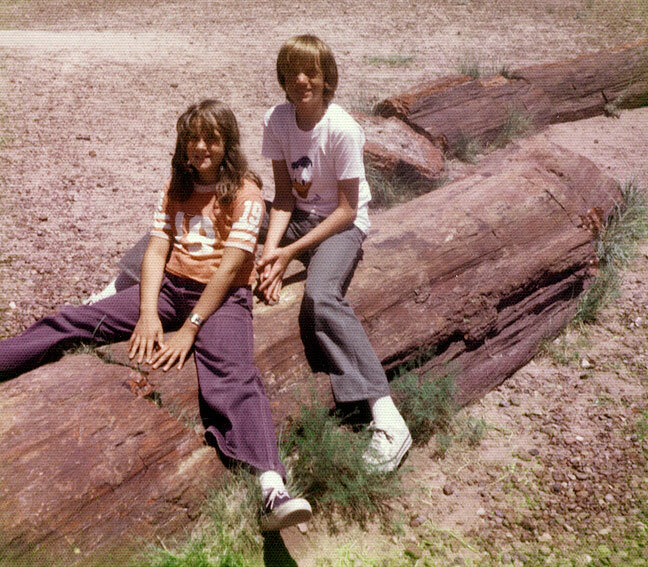 This was the result of one of those rough family moments: Dad wanted us to pose on this stump at Petrified Forest National Park, but I thought it made us look stupid. He ended up yelling at me, so I complied. 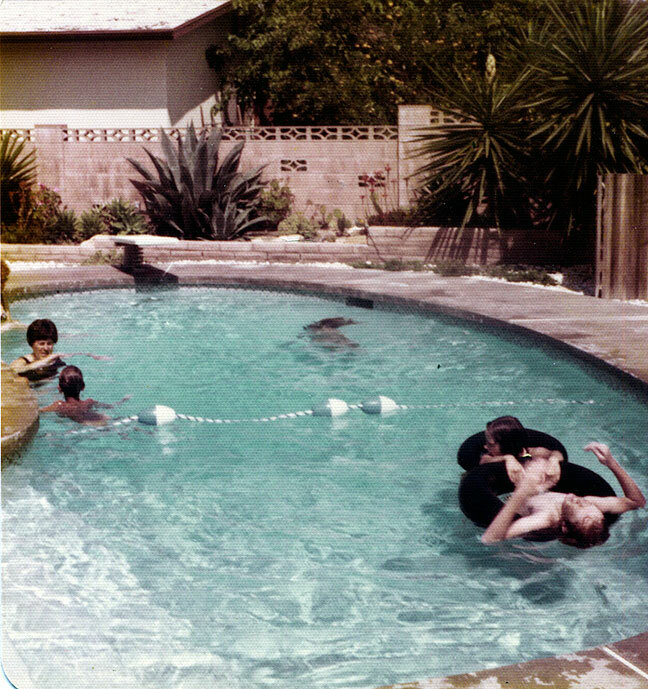 Our destination was our Aunt Margie and Uncle Bill’s place in Thousand Oaks, California, where we saw the sights and swam in their pool. Pictured are Margie, our cousin Billy, Nicole and me. 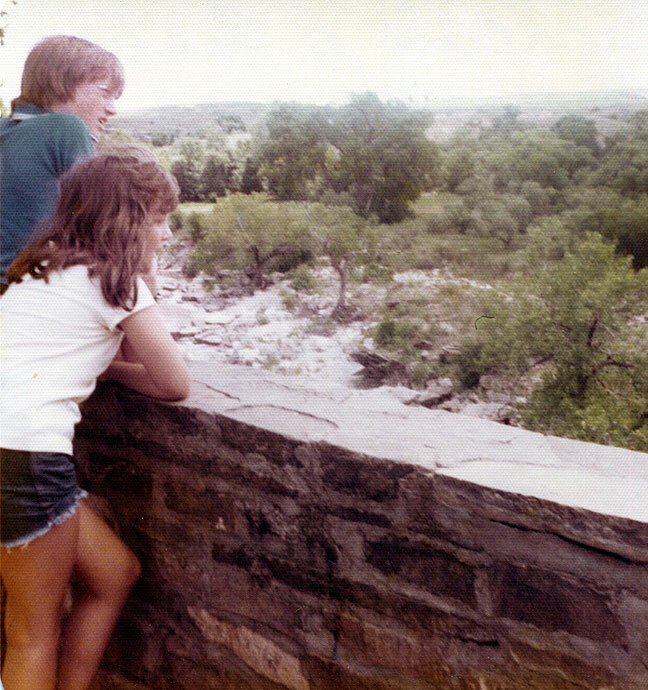 Also of note: I had a huge crush on my cousin Valerie that week. Okay, yes, I guess that image makes me seem a little autistic, slowly turning my crudely-fashioned plywood yoke left and right as the 5000-pound, 9-miles-per-gallon luxury car glided up and down the highways of the American west. But I would be flying, at least in my mind, something I wouldn’t get to do in reality until just before I turned 30. Dad said no to my request, which I thought was grotesquely unfair. In retrospect, the cavernous Cadillac probably could have held an entire cockpit mock-up and still had room for all of us and our luggage. 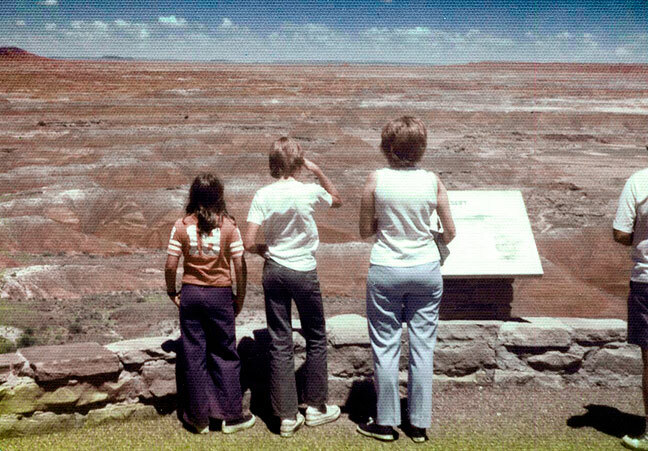 Mom, Nicole and I pose on the South Rim of the Grand Canyon. I can’t speak for Nicole’s attire, but this was my favorite jacket for years. Interesting story… Reminds me of a Chevy station wagon and an Oldsmobile, both of which were large enough to fit maybe 15 adults, that we had when I was young. The air conditioners were always broken, at least in my memory. I drew spaceship control panels in my notebooks and used those to “fly” our cars from the backseat, visiting several galaxies and space stations, not to mention engaging in a multitude of overly violent interstellar wars. (Any spaceship control panel worth its salt must have “lazer cannon” buttons.) 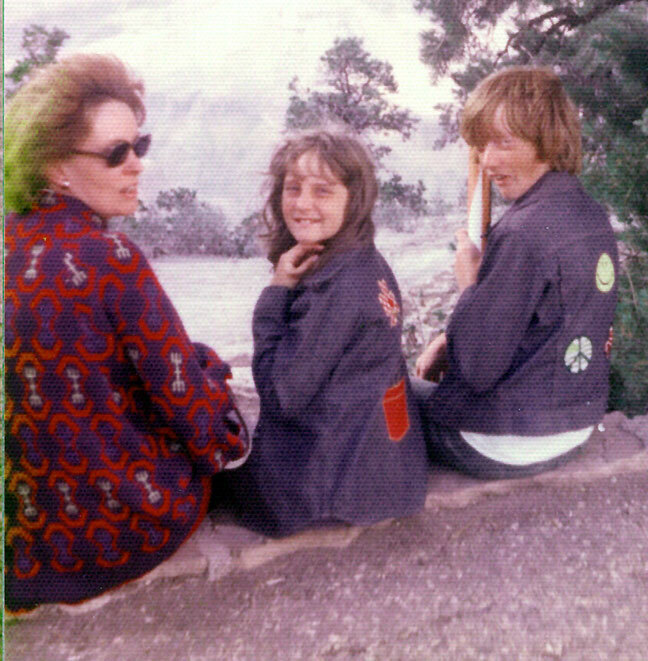 Sometimes my sisters went along with this and acted as navigators, radar operators, communication officers, or gunners. Oh my gosh, that is TOTALLY the Griswolds. One of my sisters had this same Donald Duck shirt. You don’t look stupid, but you are sitting on a log.